The 70th meeting of the Standing Committee of the Convention on International Trade in Endangered Species of wild fauna and flora (CITES) concluded today. The global spotlight now turns to the 18th meeting of the Conference of Parties in Colombo, Sri Lanka in May 2019, where the bulk of the decisions and outcomes of this meeting will be confirmed. 5 October 2018, Rosa Khutor, Russian Federation: The 70th meeting of the Standing Committee of the Convention on International Trade in Endangered Species of wild fauna and flora (CITES) concluded today. The global spotlight now turns to the 18th meeting of the Conference of Parties in Colombo, Sri Lanka in May 2019, where the bulk of the decisions and outcomes of this meeting will be confirmed. Perhaps the most significant impact of this week’s packed agenda will be on elephant conservation. The decision to allow 6 countries to exit the National Ivory Action Plan process (NIAP) was disappointing, as some of them are still major conduits for illegal trafficking of ivory. The NIAP mechanism is meant to ensure these countries report on actions they have taken to combat this criminal activity. On tiger trade, the Committee was furnished with a review of government implementation of the needed actions and of captive tiger breeding facilities feeding the tiger trade. China and Viet Nam, the countries of most concern, questioned the reports, despite not having taken the opportunity to provide input at the draft stage. Due to their objections, specific recommendations for government action could not be made at this meeting, however the Secretariat will now gather more information and provide specific recommendations for the CITES CoP in May 2019. "The parts and products of over 1,755 tigers were seized in Asia between 2000 and 2015, and recently, a third of those seizures were thought to come from captive facilities. This is a huge threat to wild tigers and we cannot procrastinate on the actions needed while wild tigers are killed and captive tigers bred to feed an illegal trade.” saidHeather Sohl, WWF's Interim Tigers Alive Initiative Leader. “Governments shouldn't wait until May 2019 to act and can implement the best practice highlighted in the reviews to improve legislation, strengthen law enforcement, reduce demand, phase out tiger farms and use enforcement tools such as photo identification and forensic analysis." Another highlight was the decision by Parties that Japan is in clear violation of the Convention for their catch and landing of sei whales, allegedly for purposes of scientific research, and the sale of their meat and blubber in retail markets. While Japan has reservations on many of the great whale species listed in Appendix I (which means they do not have to abide by the convention for those species), this is not the case for sei whales and therefore Japan is prohibited from international commercial trade in this species. Japan will have to report back by February 1, 2019 as to how they will come into compliance with the convention. “WWF first raised concerns over Japan’s hunt and sale of sei whales fifteen years ago. We are thrilled that this clear violation of international law has finally been recognized, and look forward to Japan’s cessation of their so-called “scientific” whaling operations in the North Pacific,”said Leigh Henry, Wildlife Policy Director, WWFUS. Next week, the 2018 Illegal Wildlife Trade Conference, to be hosted in London by the UK government, will provide an opportunity for global leaders to come together and make commitments to help end illegal wildlife trade. It is expected this will add greater political momentum to help deliver the many needs identified in CITES. Seized Shipment of Illegal African Elephant Tusks, Thailand Customs officials in Suvarnabhumi discover a shipment of African elephant tusks from Mozambique. 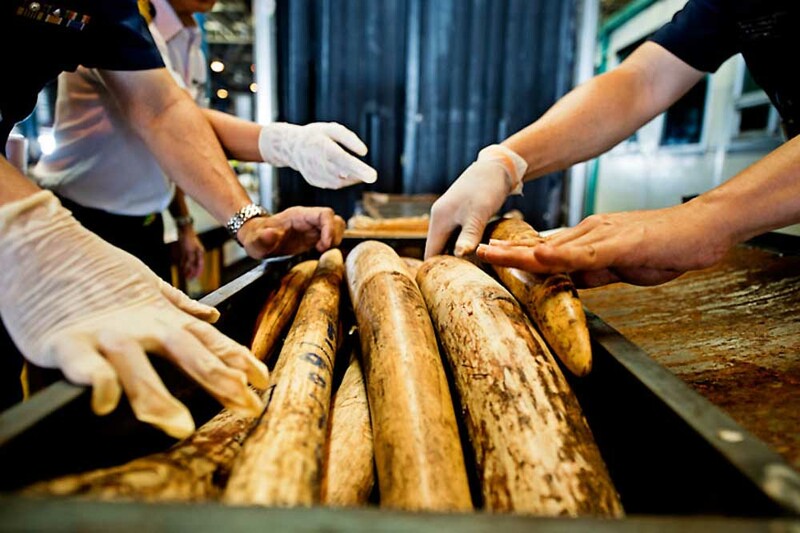 Suvarnabhumi is a major hub for both wildlife and drug trafficking, Thailand.